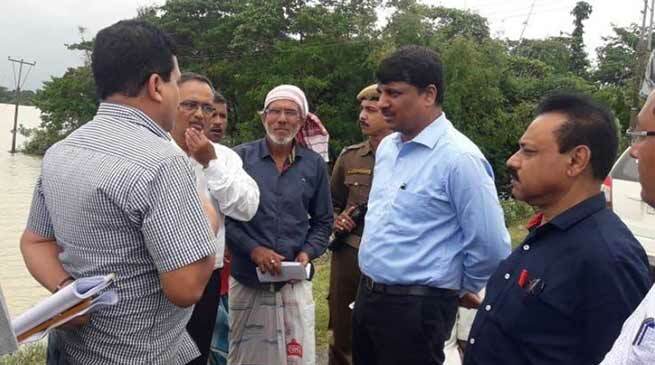 Director Agriculture, MS Manivannan visited the flood-hit Hailakandi district on Saturday to make an on-the-spot assessment of the extent of damages to cropland. Manivannan visited Kalinagar I and II under the worst-hit Algapur revenue circle where 756.5 hectares of farmland have been reeling under floods, affecting 20,958 small and marginal farmers of 89 villages. He took stock of the situation while interacting with the local farmers in presence of the District Agriculture Officer, AR Ahmed, Assistant Director and Subdivisional Agriculture Officer. The Director advised the farmers for extensive cultivation of Boro paddy under Bringing Green Revolution to Eastern India (BGREI) programme. He also asked them to go in for insurance of crops under the Pradhan Mantri Fasal Bima Yojana against adverse seasonal conditions during crop season viz., floods, prolonged dry spells, severe drought and unseasonal rains. “The insurance cover under BGREI will help you to insulate against crop loss and to tide over the crisis,” he told the local farmers. He also reviewed the extent of damages to cropland due to the deluge in a meeting with agriculture officials at the District Agriculture Office in Karimganj. Manivannan also took part in the review meetings of Chief Minister during the latter’s visit to Karimganj and Hailakandi districts in Barak Valley on Saturday. He instructed the agriculture officials to prepare the list of farmers affected together with cropland and submit them as per District Disaster Management Authority guidelines. District Agriculture Officer Ahmed disclosed that 2,484.65 hectares of cropland have suffered massive damages due to the deluge, affecting 41,747 farmers covering 261 villages. Around 100 metric tonnes of stored paddy were damaged due to inundation. Ahmed informed that heavy siltation has been noticed in Kunkunbosti, Katagaon and other areas. “The extent of siltation and detail estimate of the extent of damages will be prepared after flood water recedes,” he added.